I suspect to retire in physical, mental and financial well-being are goals most of us have. For us this means some financial planning today ensures we have a chance of ending up where we want to be. For today’s post I’d like to share some LIF withdrawal strategies I’ve been toying with. 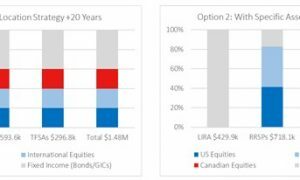 If you left a company with a pension before retirement (like I did in my late-20s) you likely had a choice to move the money into a Locked-In Retirement Account (LIRA). 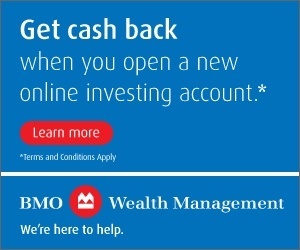 These accounts are designed to help you continue to accumulate wealth that originated from your former pension plan; the account by design is to lock-in money and for the most part you can’t touch this money although some financial hardship exceptions apply. LIRAs do not allow for lump sum withdrawals so eventually if you want income from your LIRA, you will have to either transfer the money in to a Life Income Fund (LIF) or a Life Annuity. I’m tempted to use the LIF route myself. More on that in a bit. This makes a LIF a specific type of income fund. Consider LIF like a Registered Retirement Income Fund (RRIF) – you have the flexibility of deferring taxes on the income and on the growth of those assets so long as the investments stay inside the LIF account. You are then taxed on withdrawals. LIFs are available in many provinces but not all of them. Convert LIRA to LIF at age 55 (still close to 15 years away). Invest in a few blue-chip stocks producing income inside the LIF. Take the income earned inside LIF and withdraw it at account minimums starting at age 55 (2.86%). Drain the LIF account by using account minimum withdrawals over time. I’m not sure how much we’ll have in our small LIRA when we retire but I’m optimistic we’ll have enough to cover LIF account minimum withdrawals for about 5-10 years before touching the capital. This certainly won’t be a windfall in retirement but using the minimum withdrawal criteria should help us avoid excess taxation. Do you own a LIRA or a LIF? If so, how do you manage it? 18 Responses to "LIF Income Strategies"
I have a LIRA that is under federal rules. As you noted, there are provincial rules but there are also federal rules for federal employees and federally regulated industries. There are differences. One thing you might know but forgot to mention is the ability to “un-lock” some or all of those funds. As far as managing my LIRA, I handle it very similar to my RRSP and take into account what investments are in the two of them as well my spouses. Thanks Lloyd. Yes, I was aware of the federal rules, I was really just scratching the surface here…so you are correct I left out some details. I recall “unlocking” is only for certain circumstances though, including financial hardship? I think that link to taxtips list some of the conditions. I should have also added I recall you can income-split with a LIF if the transferor is age 65 and older. This should also apply to RRIFs as well but I would need to read up on that. Interesting to know you manage your LIRA the same as your RRSP, I suppose they are very equal accounts. Thanks for your comment as always, great to hear how folks are managing this. My wife has a LIF. Our strategy is to draw it down to zero as quickly as possible by taking the maximum. The LIF is generating enough income to cover most of the withdrawal so she has to sell very few shares to cover the rest. It looks like this is going to take a very long time. Hey John, is the strategy to draw it down quickly more of a function to avoid drawing on other income? i.e., RRSP or RRIF or other? I wasn’t aware you could withdraw more than the maximum from a LIF? Is this what you mean? I’m still learning about this account and how best to use it. Hi Mark, Yes you can draw more than the prescribed maximum calculated by using the percentage year end value of the LIF. If the LIF is valued is $50,000 at the beginning of the year and $60,000 at year end of the year you can withdraw $10,000. Using the calculation from the chart a 73 year old could only withdraw $4,232.88. Another thing we did was unlock 50% of her LIF. This was a one time thing. I don’t know if that provision is still available. I also don’t know if all locked in accounts are eligible. You should check my facts. I could be wrong. I knew about the unlocking feature which is of course very good, provisions I think should be in place to unlock. Makes me think the “strings” attached to these accounts should be less rigid and more open. I get the intent of “locking” in but people should have more flexibility when it comes to their own financial accounts and investments in them. Thanks again John, still learning on this stuff and how it fits with our financial plan. It is rare for this to happen, but it is good to know. Thanks very much John. I’m just learning this is more complicated than I thought! If I understand correctly, when you convert your LIRA to a LIF you get a one time opportunity to transfer up to 50% into your RRSP. I would want to think through the idea of withdrawing from the LIF before I required the money – it will face your marginal tax rate. Why not allow it to grow tax free until you need it? It is hard to get info about LIRAs and LIFs. I would not put my faith in one opinion you get from a bank or an advisor. Insurance companies seem well versed, but they want you to buy an annuity from them. I am working through this now. I will not make a choice on it until my retirement plans are firmed up and all options are known and considered. In the mean time I will nurture my LIRA’s tax free growth. 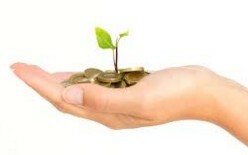 You don’t have to convert it to a LIF in order to invest it as you choose. Well, as I understand it there are two types of unlocking for the LIRA to LIF – one associated with “financial hardship” at any age and another starting at age 55 when, in the year you turn 55, you can transfer up to 50% of your assets into a tax-deferred savings vehicle such as RRSP. I am also considering deferring the assets to grow tax free but the current value of the LIRA is not very much. Unless I I become a fee-only-planner myself eventually, I might get some opinions about my LIRA from a fee-based-advisor at some point; so much to consider. The good thing is you can keep your LIRA to defer-taxes now; once you convert it to a LIF the decision has been made. I have both an RRSP and a LIRSP under the provincial rules. Here in BC, we cannot unlock the locked in account before retirement for any reason. I currently have both accounts set up with dividend-paying ETFs. I will not be drawing down the locked in account before I retire as the tax bite would be significant. When I am forced to convert them at age 71 (16 years hence), I plan to buy an annuity with the LIRSP. Between CPP, OAS & the annuity, I expect my necessities will be covered. In the meantime, I am adding $ to both my RRSP and my TFSA, with an eye to maxing out the latter. This sounds like a good plan, re: accounts set up with dividend-paying ETFs. I also wish to avoid drawing down any locked-in account before I retire because of the tax hit at my marginal rate. That’s a great plan: adding $ to both RRSP and TFSA – we’ll continue to do the same here! Mark, another good topic and a very timely one for me, since I am retired and age 56. I am looking to soon begin withdrawing from either my RRSP or LIRA, or both, for income, TFSA top up, and to avoid future clawback potential. I am currently researching information about options/regulations for my LIRA here in NS. Up to now I have treated this account and the holdings like another RRSP as part of our overall portfolio, after leaving my employer approx 11 years ago. My impression so far is this is rather complicated and restrictive, and information not so easily available. I’ll try to post up anything useful I find out. Thanks for sharing Deane. Not really sure what we’ll do, other than setting up the LIF in the post I mentioned and doing a slow withdrawal to minimize the tax bite. Ideally I’d like to kill the LIRA/LIF before OAS and CPP. That seems to make sense. OAS for me will be 67, almost another 30 years. To date I’ve treated my LIRA like an RRSP as well – there is a focus on U.S. holdings. Looks like my plan is registered in Quebec and nothing else i didn’t already know. 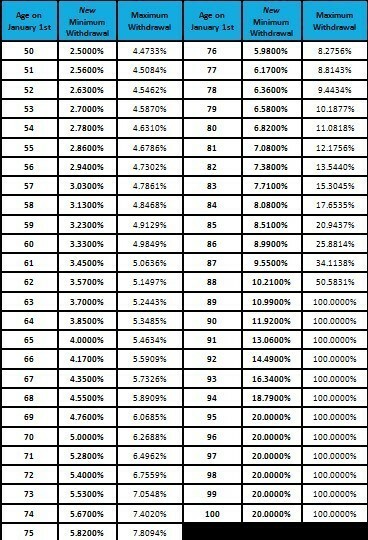 Withdrawal rates a bit different than your chart- same minimums but much higher maximums. OAS is 65 and 8 mths for me and a little earlier for my wife. For CPP we’ll make a call on several years from now. We’ve done some rough calcs for both of us to determine breakeven ages and approx benefits. For the decision I will be considering the insurance part/max payout situation Daryl Diamond described in his book, since neither of us is close to max benefits, with shorter working years and self employment. It might start as early as about 3.5 years for one of us and 4 yrs for the other. Mark-great subject matter and informative responses from your readers. I am almost 56 and essentially retired but my wife at 48 has 4 more years or so to work before she leaves her teaching job with a reduced pension. 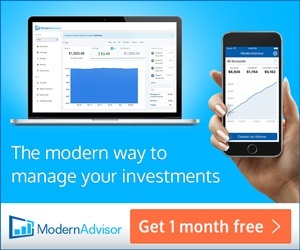 In April of this year I got out of my TD Strategic Managed Portfolio that carried a MER of 1.47% on my $843K in investments – over $1000 per month! In the past 7 days I invested using TD Direct Investing in Vanguard and BMO ETF’s-55% FI/45% Equities. I have $395K in a cash account, $57K in a TFSA, $295K in a RRSP and $115K in a LIRA. My plan was to live off the dividends and interest generated from the cash account and perhaps the LIRA (LIF). Any suggestions from you and your readers would be most welcome. Kudos to leaving the managed fund. Smart move. Saving money and keeping more for yourself. To have that saved and a pension, you’re in GREAT shape! Depending on how large the pension is, you could likely be more aggressive with equities in your personal portfolio, up to 75%. Probably good to keep at least one year of expenses in cash in retirement. This way, you have a great cushion.